With Fox Sports West airing two playoff games from 1993 last night, twitter was abuzz with memories as older fans reminisced during one of the greatest 7-game series to ever be played and newer fans were finally able to witness the drama as it unfolded. Hat tricks by both captains, a style of physical play you won’t see in the NHL anymore and enough back-and-forth action to put even the most stoic of fans on the edge of their seats. 1993 seems like so long ago – the NHL played an 84 game regular season schedule, the Ducks were still a movie – not a hockey team, Eric Lindros and Teemu Selanne were promising rookies, wearing a helmet was optional for players, Ron Hextall was wearing a Quebec Nordiques jersey (seriously! ), Gary Bettman was just named the NHL’s first Commissioner, Bruce McNall still owned the Kings and yes, mullets were cool. 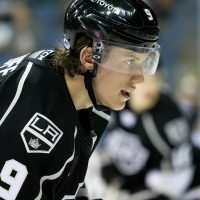 Five years prior the Kings had made ‘the trade’ with Edmonton to bring Wayne Gretzky to LA, turning Hollywood to Hockeywood. The Kings had their best year ever in 1990-91, posting 102 points and winning the Smythe Division. After losing to Edmonton that postseason and the year after, coach Tom Webster was fired. Then, prior to the 1992-93 season the Kings hired Barry Melrose – a Tony Robbins following, mullet wearing coach who had never been behind the bench for an NHL game. His star player, #99, missed the first 36 games of the season with a back injury. Luc Robitaille captained the team while he was out, in route to the best season of his career with 63 goals and 125 points. The team finished in 3rd place in their division with a record of 39-35-10, just 11th best in the 24 team league. The Campbell Conference Finals in 1993 would determine who would play the Montreal Canadians for the Stanley Cup. Hockey know-it-alls would tell you the Toronto Maple Leafs were going to send Melrose, Gretzky and the rest of the LA Kings packing. Toronto’s captain, Wendel Clark, just so happened to be the first cousin of Melrose. Clark, who played a key role in most of the games, has since said “That series was probably the most excitement I saw around here,” referring to Maple Leaf Gardens. Game 1 – while the Maple Leafs defeated the Kings 4-1 to take the early series lead, the real story of the game centered on a hit LA defenseman Marty McSorley put on Gilmour. 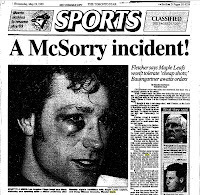 Clark took exception to the hit and went after McSorley, in what became a series long theme (click here for video of the whole incident). The hit also enraged Burns, who tried going after Melrose on the bench, convinced he ordered the hit on Gilmour. The coaches were beginning their own war too. 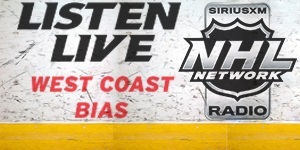 Burns began to take aim at Melrose through the media – feeling the Kings coach didn’t respect him or his team. After Melrose made a comment about the Leafs being good at protecting a lead because they have “10 guys 30 years old. They plug up the middle pretty well.” Burns retorted with “We had 99 points this year, his team had 88. I guess our 30-year-olds did a pretty good job clogging up the middle. 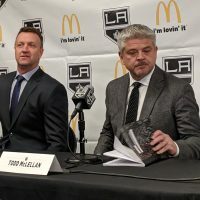 We beat Detroit and St. Louis, and I firmly believe we’ll beat the Los Angeles Kings, too.” The war of words later escalated to Melrose commenting on Burns’ weight – even telling him to have another donut – while Burns would call him Billy Ray Cyrus. Game 5 – in the first of back to back overtime games, the Leafs win 3-2 when Anderson whacks a puck out of the air with 40 seconds left in the extra period…the Leafs now lead the series 3-2 and the series heads back to LA. 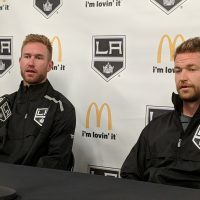 Urban myth has it that Wayne addressed the team before the game and asked them to give it their all to tie the series and send things back to Toronto, where he promised he would take care of things in game seven. It almost never came to be. The Kings dominated the first two periods and were up 4-1 early in the third. However, Clark scored three goals for the Leafs to even the game 4-4 and send things to overtime. Early in the fourth period Gretzky high-sticked Gilmour for what Leaf fans will forever claim should have been a penalty. Referee Kerry Fraser disagreed and play continued. From behind the net Robitaille set up Gretzky to win the game. Kings 5, Leafs 4. Board the plane. We’re going back to Toronto for game seven and a possible trip to the Stanley Cup Finals. Gretzky opened the scoring on a shorthanded give-and-go with McSorley to provide the Kings an early 1-0 lead. He then set up Tomas Sandstrom for a goal to put the Kings up 2-0 at the end of the first period. Toronto tied things up early in the second on goals from Clark and then Anderson. Melrose called a time out to settle things down. At the half way point of the second period Gretzky was alone in the slot and put a slap shot past Potvin to give the Kings the lead again at 3-2. Like the intermission before, the Kings were leading at the break. Clark scored his second goal of the game just minutes into the third period to tie things up once again. Both teams rushed up and down the ice repeatedly for over 10 minutes, neither scoring. 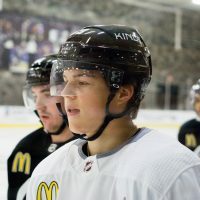 With just under four minutes remaining in the third, Kings forward Mike Donnelly scored on a rebound of a shot originally taken by Alex Zhitnik – giving the Kings a precious one goal lead. Just seconds later Gretzky ended up with the puck, circled behind the net and backhanded it off the skate of Leafs defenseman Dave Ellet. It went by Potvin and the Kings now had a two goal lead on #99’s hat trick. The next few minutes probably seemed like an eternity to Kings fans everywhere. Then, with about a minute to go, Ellet got a small sense of redemption, scoring to pull the the Leafs close, now trailing by just a goal. Tick, tock…pass, shot, save…rinse, repeat…ten seconds left…three seconds left…game over. Kings win the game 5-4 and the series 4 games to 3. Gretzky has been quoted as saying that his performance in game 7 was the best NHL game of his career. For Kings fans it will certainly was. 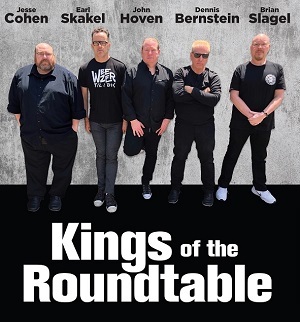 With a roster full of guys like Corey Millen, Gary Shuchuk and Pat Conacher the Kings beat an original six team in the playoffs for the first time since entering the league in 1967. Oh yeah, they also had guys named Granato, Carson and Blake. In two of the iconic moments in franchise history, Gretzky skated over to the bench after the game to give Melrose a huge hug (pictured at right)…later in the locker room, Luc Robitaille kissed Dave Taylor as they celebrated around the Campbell Conference trophy (picture above). It most likely was the greatest seven game series ever played in the National Hockey League and the mere mention of Kings-Maple Leafs will forever bring back memories of that epic playoff battle. Ah, 1993…when mullets were cool and the Kings owned LA.